Would you like to have met Coco Chanel? You can in this new audio collection from The Amazing People Club. Over the past 50 years, women's roles in business have advanced dramatically. 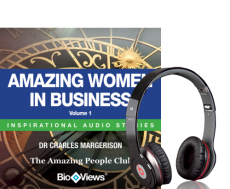 These inspirational audio collections explore the very different lives of a group of amazing business women. Meet the charismatic Beulah Henry, the ambitious Elizabeth Arden and the determined Madam C.J. Walker. It's as if they came back and gave a personal interview on their lives. You'll gain a better understanding of their real lives and challenges and be inspired by what they did and how they achieved it. Each story comes alive through BioViews. A BioView® is a short biographical story, similar to an interview. These unique stories provide an easy way of learning about amazing people who made major contributions to our world and can help you achieve your ambitions in your journey through life.